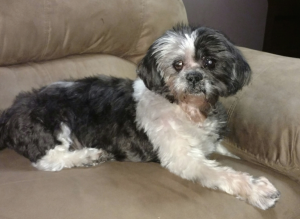 Snickers, a handsome Shih Tzu, spends his days lounging with his Dad and fur siblings. 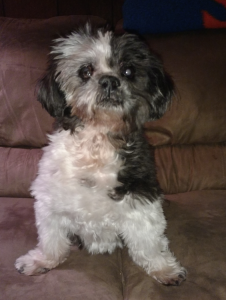 At 15 years young, he is loving life, enjoying treats and playing with his toys. This story could be very different had Snickers not received stereotactic radiosurgery (SRS) to treat his cancer. Back in December of 2012, Snickers was at the groomer getting ready for the holidays. When his Dad picked him up, the groomer mentioned that Snickers seemed to have bad tooth that was bothering him. A closer look showed the right side of Snickers jaw to be a little red and swollen. Snickers’ Dad, George, made an appointment to see their local veterinarian the next day. Sadly, it wasn’t as simple as a bad tooth. Snickers was diagnosed with cancer. After being examined by his veterinarian, Snickers was diagnosed with advanced oral squamous cell carcinoma. The prognosis was poor. Snickers and his Dad were referred to PetCure Oncology at the Veterinary Radiosurgery & Imaging Center (VRIC) in New Jersey. Due to the location of the tumor, standard radiation therapy was not an option. Stereotactic radiosurgery (SRS) was suggested as the best plan of care, however there was only a 10% chance Snickers would respond to the treatment. George tells the story of his aborted attempt to have Snickers euthanized; together they made the trip to the veterinary office but did a U-turn in the parking lot. George decided he wanted to do all he could to save his furry family member and in January of 2013 Snickers received SRS treatment. Fast-forward to 2016, Snickers not only responded but THREE YEARS later he’s a happy boy enjoying life with his family. 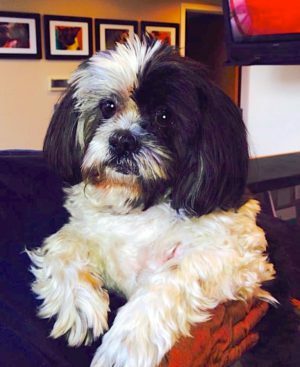 Snickers was treated at PetCure Oncology at Veterinary Imaging and Radiosurgery Center in Clifton, New Jersey. PUPDATE: Snicker’s Dad sent us some photos of the handsome boy that we just had to share. These two photos were take in January of 2016!